Toxic contamination is a significant concern in the Columbia River Basin in Washington and Oregon. 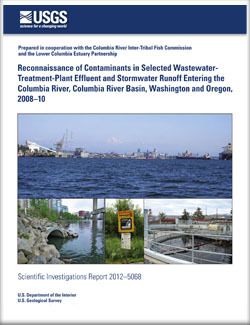 To help water managers and policy makers in decision making about future sampling efforts and toxic-reduction activities, a reconnaissance was done to assess contaminant concentrations directly contributed to the Columbia River through wastewater-treatment-plant (WWTP) effluent and stormwater runoff from adjacent urban environments and to evaluate instantaneous loadings to the Columbia River Basin from these inputs. Nine cities were selected in Oregon and Washington to provide diversity in physical setting, climate characteristics, and population density—Wenatchee, Richland, Umatilla, The Dalles, Hood River, Portland, Vancouver, St. Helens, and Longview. Samples were collected from a WWTP in each city and analyzed for anthropogenic organic compounds, pharmaceuticals, polychlorinated biphenyls (PCBs), polybrominated diphenyl ether (PBDEs [brominated flame-retardants]), organochlorine or legacy compounds, currently used pesticides, mercury, and estrogenicity. Of the 210 compounds analyzed in the WWTP-effluent samples, 112 (53 percent) were detected, and the detection rate for most compound classes was greater than 80 percent. Despite the differences in location, population, treatment type, and plant size, detection frequencies were similar for many of the compounds detected among the WWTPs. By contrast, the occurrence of polycyclic aromatic hydrocarbons (PAHs) was sporadic, and PCBs were detected at only three WWTPs. The stormwater-runoff samples were analyzed for a slightly different set of contaminants, with the focus on those expected to be related to road and land runoff—PCBs, PBDEs, organochlorine compounds, PAHs, currently used pesticides, trace elements, mercury, and oil and grease. A complex mixture of compounds was detected in stormwater runoff, with detections of 114 (58 percent) of the 195 compounds analyzed. The detection patterns and concentrations measured in the stormwater-runoff samples, however, were more heterogeneous than in the WWTP-effluent samples. This reflects differences in various factors, including suspended-sediment concentrations and known contamination sources present in some watersheds. Trace elements and PAHs, which are related to automobiles and impervious surfaces, were the most widespread compound classes detected in stormwater runoff, a typical finding in stormwater runoff in urban areas. With a better understanding of the presence of these contaminants in the environment, future work can focus on developing research to characterize the effects of these contaminants on aquatic life and prioritize toxic‑reduction efforts for the Columbia River Basin. Morace, J.L., 2012, Reconnaissance of contaminants in selected wastewater-treatment-plant effluent and stormwater runoff entering the Columbia River, Columbia River Basin, Washington and Oregon, 2008–10: U.S. Geological Survey Scientific Investigations Report 2012–5068, 68 p.